BEFORE: Getting my wisdom teeth removed this morning was the inspiration for the next two films in the marathon; films that involve dentistry in some way. 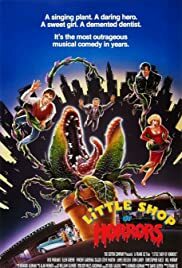 I begin with Little Shop of Horrors (1986). Also of note, this is the first musical in this marathon. AFTER: It’s not that I hate musicals; I don’t. I very much enjoy Willy Wonka and the Chocolate Factory or a Disney animated musical, but not much else. I just don’t see the point of people randomly breaking out into song. You can just as easily advance plot without singing about it. The difference I think with Willy Wonka or any of the Disney musicals, is the songs aren’t required. They’re nice, catchy, and entertaining to sing along with, but if they weren’t in the movie, you wouldn’t be losing a lot of the story. Little Shop of Horrors is one of the musicals I don’t like. Every five minutes there’s another song to explain what’s going on and the songs are the major source of plot development. Take the songs out, your left with a couple minutes of dialogue that get the character’s feelings across. Still, it’s not the worst film I’ve ever seen. Audrey II, the extraterrestrial plant, was quite well done. The plant was operated by puppeteers, as opposed to being animated in post-production, and the quality was amazing, especially for 1986. Audrey II looked life-like and its actions and mouth movements were all timed very well. I guess it shouldn’t be a surprise at the film was directed by Frank Oz, the man behind the Yoda puppet in the original Star Wars films as well as a puppeteer on The Muppet Show and Sesame Street.